A friend recently sent us a web link with the title “40 Maps That Will Help You Make Sense of the World”. For purposes of this blog, we highlight four maps for you to reflect on and to think about what it reveals about our priorities and policies. The first map is designed to get you thinking about the three maps that follow. The map reveals that all but a few countries drive on the “right side” of the road. As you look at the three maps that follow ask yourself, are we driving on the right side of the road on some key issues? Keep in mind that uniqueness is not necessarily a problem. The U.S. is unique in many ways—some positive and some negative. Another way of thinking about it is to ask, is the U.S. leading, following, or are we simply dragging our feet? The second map indicates that the highest paid public employee in the vast majority of our states is a not the governor, a famous brain surgeon, or a college president, but a college coach! Below is the complete map with a link to a fascinating article on this topic. As anyone who knows us will attest, both of us are huge sports fans and, in fact, one of us was a Division 1 student-athlete. While our elected officials often claim that education is our highest priority, this first map may lead an objective observer to conclude that athletics is our highest priority as a country. The next map we have selected indicates the number of countries in the world like the USA that have elected not to adopt the metric system. If we are serious about competing in a globally connected world perhaps it’s time to revisit whether it’s finally time to go metric. For a brief description of the history of adopting the metric system in our country, see Smith, M. (2012) Transitioning from Adoption to Implementation of the Common Core State Standards. 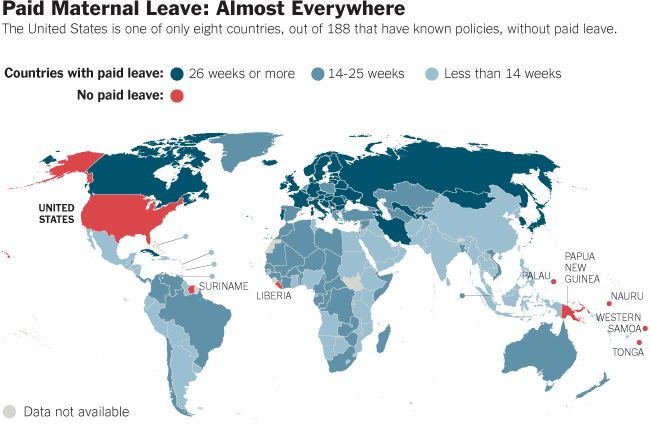 Like the metric map, the maternal leave map below shows that the rest of the world has taken a very different position. In terms of the metric system and maternal leave, the countries that have adopted the same position are not the countries that are leading the world in education. The world has and is changing. On that we can agree. Yet, we continue to make decisions that indicate we are taking the path of least resistance by clinging to what we know—our past. Education is about preparing students to live in their world, not the world we grew up in. We have to eliminate the That’s The Way We’ve Always Done It (TTWWADI) mindset. This does not mean thinking out of the box. We may need to create a new box. Finally, behaving in a different way for the sake of being different can be just as problematic as refusing to change. We need to focus our energies on solutions not on problems.